To make Chole: Heat 2tsp oil in a pan, add the onions and cook for 2~3 minutes or until translucent. Add the ground cumin, ground coriander, chili powder, amchur powder, garam masala and ½cup of water. Mix well and cook for 1~2 minutes. Next add the tomato puree and cook for 2~3 minutes, stirring frequently. Add the cooked chickpeas, salt and pepper; mix well and cook for 4~5 minutes, while lightly mashing the chickpeas with a potato masher. Set aside until ready to serve. To make Aloo patties: Heat 2tsp oil in a pan, add nigella and cumin seeds, once the seeds start to splutter, add the green chilies and cook for a few minutes. In a mixing bowl, combine mashed potatoes, green peas, cilantro, corn starch, salt and the tempering. Mix well and divide the mixture into 8 equal portions. Roll each portion into a round tikki and flatten it slightly. Heat a little oil on a nonstick tawa and cook the tikkis until lightly browned on both sides, about 2~3 minutes per side. 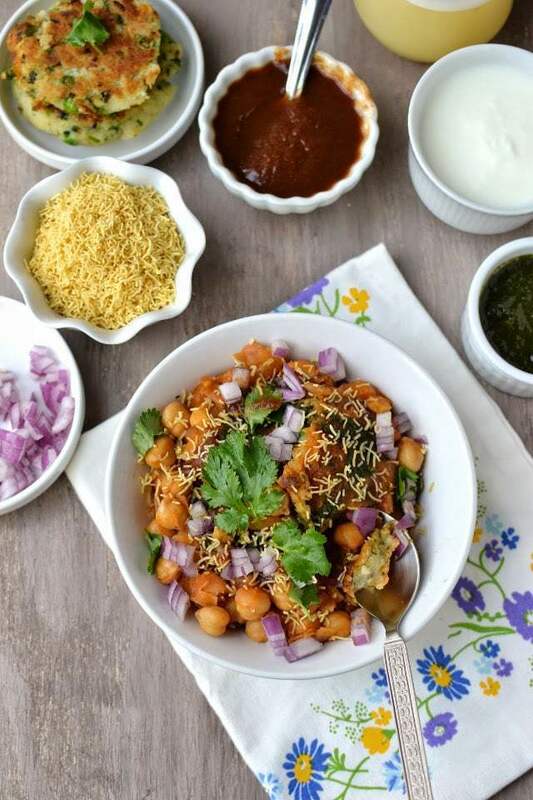 To Serve: Place 2 tikkis in a serving bowl, top it with some chole, sev, green chutney and tamarind chutney. Serve immediately.